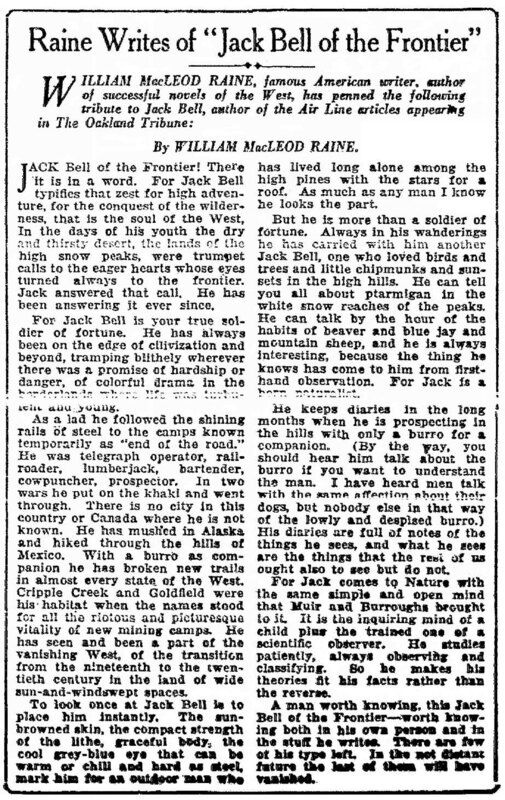 Raine Writes of "Jack Bell of the Frontier"
JACK Bell of the Frontier! There it is in a word. For Jack Bell typifies that quest for high adventure, for the conquest of the wilderness, that is the soul of the West. In the days of his youth the dry and thirsty desert, the lands of the high snow peaks, were trumpet calls to the eager hearts whose eyes turned always to the frontier. Jack answered that call. He has been answering it ever since. For Jack Bell is your true soldier of fortune. He has always been on the edge of civilization and beyond, tramping blithely wherever there was a promise of hardship or danger, of colorful drama in the borderlands where life was turbulent and young. As a lad he followed the shining rails of steel to the camps known temporarily as "end of the road." He was telegraph operator, railroader, lumberjack, bartender, cowpuncher, prospector. In two waars he put on the khaki and went through. There is no city in this country of Canada where he is not known. He has mushed in Alaska and hiked through the hills of Mexico. With a burro as companion he has broken new trails in almost every state of the West. Cripple Creek and Goldfield were his habitat when the names stood for all the riotous and picturesque vitality of new mining camps. He has seen and been a part of the vanishing West, of the transition from the nineteenth to the twentieth century in the land of wide sun-and-windswept spaces. To look once at Jack Bell is to place him instantly. The sun-browned skin, the compact strength of the lithe, graceful body, the cool grey-blue eyes that can be warm or chill and hard as steel, mark him for an outdoor man who has lived long alone among the high pines with the stars for a roof. As much as any man I know he looks the part. But he is more than a soldier of fortune. Always in his wanderings he has carried with him another Jack Bell, one who loved birds and trees and little chipmunks and sunsets in the high hills. He can tell you all about ptarmigan in the white snow reaches of the peaks. He can talk by the hour of the habits of beaver and blue jay and mountain sheep, and he is always interesting, because the thing he knows has come to him from first hand observation. For Jack is a born naturalist. He keeps diaries in the long months when he is prospecting in the hills with only a burro for a companion. (By the way, you should hear him talk about the burro if you want to understand the man. I have heard men talk with the same affection about their dogs, but nobody else in that way of the lowly and despised burro.) His diaries are full of notes of the things he sees, and what he sees are the things that the rest of us ought also to see but do not. For Jack comes to Nature with the same simple and open mind that Muir and BUrroughs brought to it. It is the inquiring mind of a child plus the trained one of a scientific observer. He studies patiently, always observing and classifying. So he makes his theories fit his facts rather than the reverse. A man worth knowing, this Jack Bell of the Frontier - worth knowing both in his own person and in the stuff he writes. There are few of his type left. In the not distant future the last of them will have vanished.